Wedding2point0: Should you change your surname at marriage? Should you change your surname at marriage? Think carefully about this question. 1) Neither bride nor groom is required to change their surname to get married. (You may remain Jane Pepsi and John Cola). You may keep your original name for professional reasons, family reasons, or because that's who you are. 2) Either bride or groom or both MAY change their surname. (You may both become Mr and Mrs Pepsi-Cola, or Pepsico, or ColaPepsi, or many other variants. John Cola might become John Pepsi. You might choose to become Mr and Mrs. Dr.Pepper. You might use your former last name as a middle name, aka Hilary Rodham Clinton: Jane Pepsi Cola). 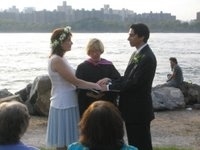 3) You do not have to decide to change your name at the time of the wedding. You may change your name(s) any time afterwards - for instance, if you have children. 4) You cannot go BACK and change your actual marriage license if you change your mind at a later date about a new surname: you will have to go through a legal process to make any changes in the future. (Mrs. Pepsi-Cola may not have her marriage license altered to change her name back to Jane Pepsi. But she may make a court petition to change her name back to Jane Pepsi. The marriage license will remain Pepsi-Cola, as that's what she decided the day she applied for the license). 5) Once you change your legal names, you'll need to change: social security, drivers license, passport, voter registration, (IRS - address change only), vehicle title/ registration, workplace, financial institutions, insurance, medical, utilities, credit cards etc. There are a number of online kits that have forms and detailed instructions on where to send each form (or if you need to make a personal appearance) as well as what additional documentation you'll need. Therefore, when in doubt, do nothing. Here is more general information, and the regulations vary state by state. No. When you marry, you are free to keep your own name, take your husband's name or, if you wish, adopt a completely different name. Your husband can even adopt your name, if that's what you both prefer. Give some careful thought to what name feels best for you. You can save yourself considerable time and trouble by making sure you are happy with your choice of name before you change any records. Any change other than taking your husband's name will probably require a petition to the court. Yes. Some couples want to be known by a hyphenated combination of their last names, and a few even make up new names that combine elements of each. For example, Ellen Berman and Jack Gendler might become Ellen and Jack Berman-Gendler or, perhaps, Ellen and Jack Bergen. You can also pick a name that's entirely different from the names you have now, just because you like it better. In the past, it was relatively easy to make all these changes simply by consistently using your new name. Today, unless you follow the traditional pattern of a woman adopting her new husband's last name, you will probably need to go to court to get an official order changing your name.